My Verizon G4 gets pretty darn hot with virtually any type of use. And my battery life isn't nearly as good as reported by many on this forum. Have any Verizon users had luck with troubleshooting the heat/battery "issues"? I'm not on Verizon but if you want to post some detailed screen shots and tell us about how you use the phone, plenty of people with ideas on troubleshooting. The heat and lack of battery life could be a rogue app keeping the phone constantly awake. I'm thinking that it is app related as well. My phone (Verizon) got warm when I first got it and it was during set up. Since then not even remotely warm....I use Youtube, Nav and Pandora but do not play games. - I did a factory reset right out of the box, before setting anything up. Don't blame you one bit if you don't want to go there, especially if you've got things all set up to your liking. - Disabled some of the Verizon & LG bloat. - I don't have any games loaded. Hope you're able to solve the issue without too much fuss. My phone gets warm sometimes but not hot. My battery isn't great but I'm a heavy user. I did a factory reset out of the box as well, and another to try to fix a Bluetooth audio distortion issue (which did seem to resolve itself with the reset). My phone seems to get very warm with Chrome use. I'm happy to try other browsers if they function the same. I tried Dolphin briefly last night and it didn't appeal to me. I haven't disabled any bloatware. Happy to do so, though. Any suggestions on which particular apps to disable? Edit to add....this is my first phone without a case, so its entirely possible I'm more sensitive to heat, especially coming off the back of the phone. I can't swear that this phone gets any warmer than my LG G3. Mine will get warm every once in a while but not to where it concerns me but will do a restart and that tends to calm it down. I'm a fairly heavy user depending on what my day is so I'm not certain it's a app thing versus nonstop usage. I've had good luck with Chrome Dev. Still Chrome but it's updated more frequently. Kinda like alpha testing. I haven't had an issue yet and I switched to it on the G3. I would disable chrome, try chrome dev, and use Access Lock to restrict the keep awake permission. That way it can't run in the background. I have leather so no case here either but I rarely feel any real heat. Maybe a little when charging or gaming but certainly not when using apps or surfing the web. For bloat, you can disable whatever you don't use in app manager in settings. For those that don't allow you to disable in app manager, you can try the debloater tool I made a thread about to disable those. Not sure if any of these will resolve your issue, but if you don't actually use them it certainly can't hurt to disable them. If the heat you're feeling is mostly on the screen, please try Lux; I've found that it has greatly reduced the amount of time the phone spends at 100% brightness and therefore the screen doesn't get as hot. Any chance having developer options enabled generally (and animations at .5x) could be causing my heat and battery life issues? Just a thought. I'm on Vz, as well. My phone has heated up some, but has largely been udner cotnrol with that. It does get pretty warm when quick charging, which is expected. It did heat up noticably last night while using the camera for aa while. My battery life has also been a source of frustration, but in an unusual way. 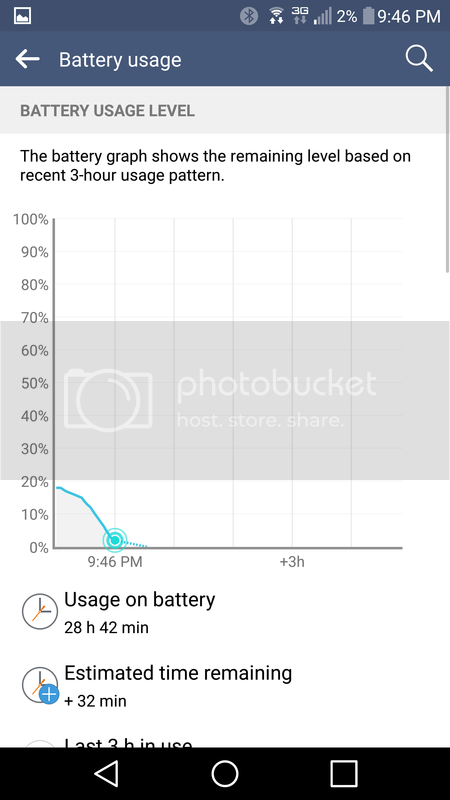 I have had good sceen on time, but bad overall life (something like almost 5 hours average SoT, but only average 11 hours of full battery life). It makes no sesne. One thing I've been watching is in my battery stats under Android OS. The kept awake time was seemingly way too high. I have a hunch it may have at elast something to do with our phones on Vz, but can't say that conclusively. Check yours and let me know what you have for that. Since Advanced Calling 1.0 is unique to us, I have turned that off to see if that is the culprit. Not that I have a clue, but I wouldn't think so., I do also have both as you do. When I disabled animations entirely on my Turbo it messed up the dialer. Is that not an issue with the G4 and Lollipop? beacuse I'd certainly prefer that to .5. OK, here are some screen shots from my Verizon LG G4. Light usage. Screen on 50%, non-auto. 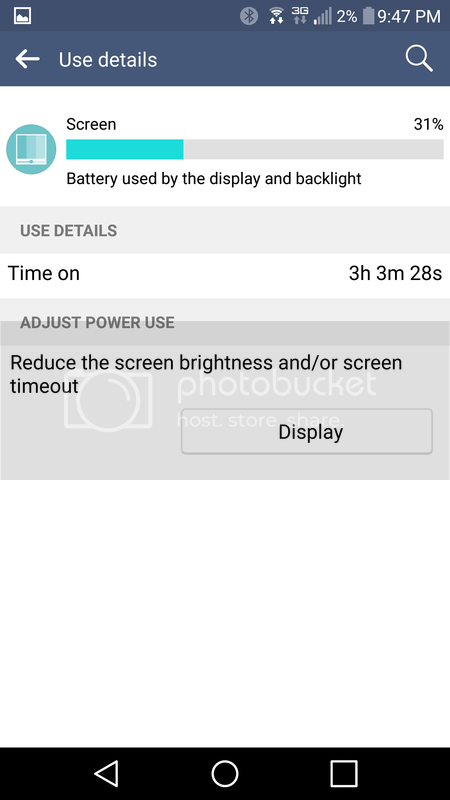 Just 3 hours SOT. Nowhere near what others are getting. With 28 hours up time it would be tough to get much more SOT, especially with that 1 bar cell signal. If you wanted 5 hours SOT you could get it but your up time would be about 12 hours most likely. So nothing looks odd that's worth investigating further? Any tips for improving battery life? Thanks for the help. In those screenshots everything looks pretty good. 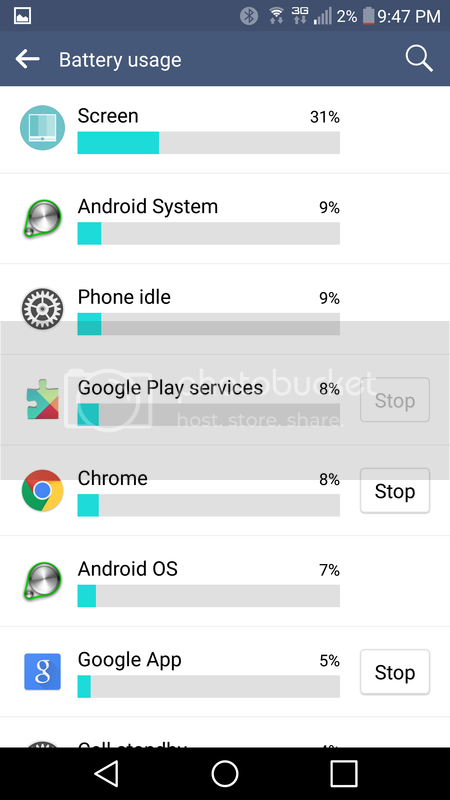 Screen is your biggest battery usage by far so it doesn't look like anything is running rogue. Unless you are making huge sacrifices in the way you want to use your phone, then I personally would be satisfied with those results. But that's me. 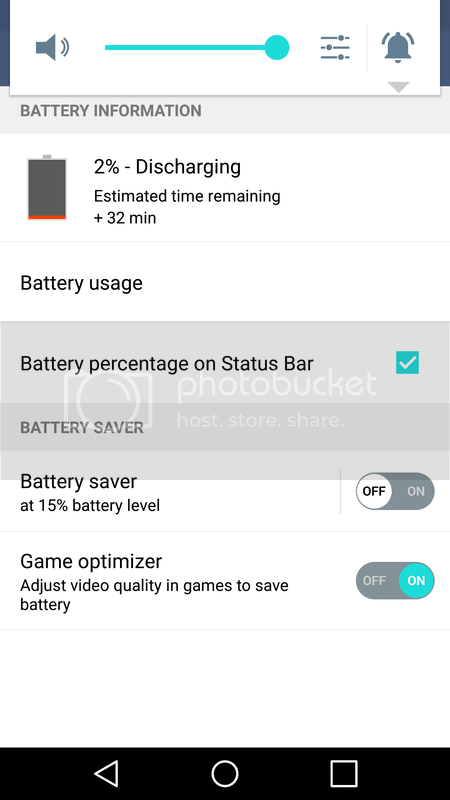 The more standby time you use, the less SOT you are going to get. 28 hours with 3.5 SOT. That sounds really really good IMO. Because I have a slightly limited plan (and I hate Amazon apps) I disabled most of the background data functions. This will cut down on the push notifications, but I don't like them anyway (OK, I'm a dinosaur - I like my phone to talk to me when I want to). It will also cut down on the time the 4GLTE radio & phone processor is running. Settings, Data Usage and it will list the usage by each app for your service period. You can click on an app, and disable background data. For some, you can go directly to app settings. I disabled everything I didn't want a push notification from. Not only is my phone fast, but the battery only gets hot while I'm charging. Remove camera icon from swipe lock screen on Moto G with 5.1? Is that the phone I've seen on TV?